1) button : Activates voice recognition. 2) button : Places and transfers calls. 3) button : Ends calls or cancels functions. 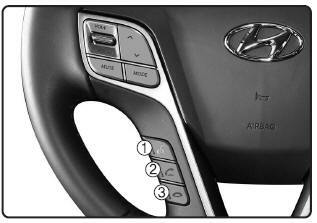 ➀ Shortly press (under 0.8 seconds) the key on the steering remote controller . 2. Select [OK] button to enter the Pair Phone screen. Hear, enter the passkey “0000” to pair your Bluetooth® Wireless Technology device with the car audio system. Hear, check the passkey on your Bluetooth® Wireless Technology device and confirm. 1. The following steps are the same as those described in the section "When No Devices have been Paired" on the previous page. Bluetooth related operations are possible only within devices that support Handsfree or audio features, such as a Bluetooth® Wireless Technology mobile phone or a Bluetooth audio device. If a connected Bluetooth® Wireless Technology device becomes disconnected due to being out of communication range, turning the device OFF, or a Bluetooth® Wireless Technology communication error, corresponding Bluetooth® Wireless Technology devices are automatically searched and reconnected. If the system becomes unstable due to communication errors between the car Handsfree and the Bluetooth® Wireless Technology device, reset the device by turning off and back on again. Upon resetting Bluetooth® Wireless Technology device, the system will be restored. After pairing is complete, a contacts download request is sent once to the mobile phone. Some mobile phones may require confirmation upon receiving a download request, ensure your mobile phone accepts the connection. Refer to your phones user’s manual for additional information regarding phone pairing and connections. From the paired phone list, select the device you want to connect and select [Connect]. From the paired phone list, select the currently connected device and select [Disconnect] button. From the paired phone list, select the device you want to delete and select [Delete] button. To re-use a deleted device, you must pair the device again.